Two months ago, Erica posted comparison photos showing seedlings started in a south-facing window vs seedlings started under full-spectrum grow lights. The results were surprising to many readers (including me!) and at least a few readers invested in grow lights after seeing the difference light makes. 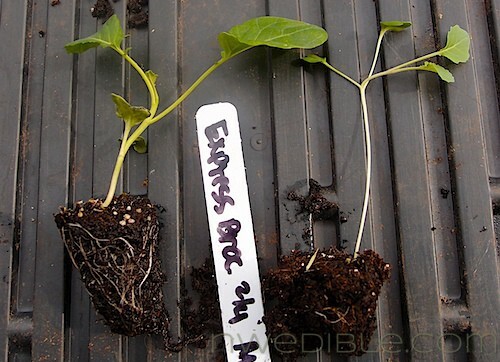 There are a few reasons why windowsill started seedlings can rarely compete with those grown under good quality light, and it’s worth understanding the science of why. Even the sunniest window doesn’t provide the hours of sun that we think it does. A seedling sitting a foot back from a three foot wide, south-facing window receives direct illumination over (at best) a 110 degree arc of the sun’s passage – or about 7 1/3 hours. The same seedling under artificial light can enjoy 12-16 hours of uninterrupted illumination. Quite a difference, but the duration of illumination isn’t the only thing to think about. Plants depend on photons of certain wavelengths to trigger different phases of the complex chemical reactions involved in photosynthesis. Humans see these different wavelengths as colors: longer waves as red, on through orange, yellow, green, blue and violet with the shortest of visible wavelength. Longward of the visible color spectrum is the infrared, which transmits heat and is the source of those nifty thermal imaging videos shot from helicopters. Shortward is the ultraviolet which fades your furniture and gives you suntans and skin cancer. Plants require light that falls in a wavelength range called the Photosynthetically Active Radiation or PAR. This stretches from about 400 nanometers to 700 nanometers. The edges of this range – 400 to 450 nanometers and 680 to 700 nanometers are particularly important. Note the double peaks of the chart below showing where a plant’s photosynthesis is most active across the spectral range. The double-hump curve of a plant's photosynthetic needs. Image: Wikipedia. Superficially, the photosynthetically active radiation range lines up pretty well with the human visual range of, typically, 390-750 nanometers, and our region of peak sensitivity of around 550 nanometers (greenish). Incidentally, if you want to really have fun with this, consider one primary role of vision in a foraging proto-human: identifying yummy plants. Our eyes have their peak sensitivity in the green range, precisely the range reflected by photosynthetic organisms. This gives the human eye its greatest light sensitivity just at the color where plants are most visible. Fans of evolution can postulate how natural selection would favor the development of peak vision in this range. Fans of intelligent design can marvel at the intentionally interconnected nature of everything. Our eyes and the needs of our green-leaved friends are not as compatible as it might seem – and us humans love to tweak our environment. We like to stay cool, we like our sofas and carpets to last a long time, and we like pleasing colors that don’t force us to go around squinting. To accomplish this, we deliberately select what light will reach the insides of our homes by applying various coatings to our windows. Modern windows are designed to reflect infrared radiation to keep things cool, reflect ultraviolet radiation to stop fabrics, books, art, and paint from fading, and present a pretty and not-too-bright view of outside. To do this they filter (absorb or reflect) some of the incoming radiation. A simple single-pane window, such as you might find in an older home or a greenhouse, will transmit 80-85% of the light in the region that a plant cares about. A blinged-up, coated, multi-pane window might transmit as little as 25-50% of the light in the key 680-700nm region. Various coating materials are applied to, selectively, block out some of the UV and blue light – and while the aim here is really at stopping the 300-380 nanometer range most treatments seem to extend into the 400’s. From a consumer standpoint that’s just fine, since we tend to see blue light as harsh and unpleasant but to a plant with high-light needs blocking light in that spectrum is akin to a semi-starvation diet. Meanwhile, the desire to keep things comfortable inside leads to treatments that block longer wavelength radiation including, of course, that critical 680-700 nanometer region. So don’t go and build a greenhouse out of spare double-pane household windows, okay? Instead, go to that salvage yard and pull some leaky single-panes. How about some of those great 1950’s picture windows…perfect! The polycarbonate materials used in most greenhouses (including ours) are pretty good at transmitting the PAR region – even though they sometimes have a “milky” look to our eyes, the right light is still making it through. They are about 80-90% transmissive all through the visual and PAR range. The plastic sheeting that we use for a lot of our winter time cloching transmits about 70% of light – and though I haven’t found precise spectral transmission curves for this stuff, I found a lot of discussions on boards dedicated to growing…ahem…cannabis. Most plastics are pretty evenly transmissive in the visual and photosynthetic wavelengths. It is only when they are treated or coated that stuff starts to get blocked out. I dug into finding the spectral transmission properties of Reemay – and unfortunately got little beyond bland statements that it transmits 75-85% of light. Nothing on what spectral content gets transmitted, unfortunately, except for some research done that indicates it is about 20% transmissive shortward of 380 nanometers. But practical experience tells me that Reemay is just fine as a cover material. It doesn’t seem to hamper the growth of plants unduly, probably because it is mostly open space. Plenty of light (of all spectral domains) can flow through the interstices between the little teeny strands of polyester. It shades a bit, but primarily not by filtering light but by blocking it. There’s actually a lot more to this topic – plants live in a world of light and derive a lot of seasonal queues from the spectral content of the light, the length of daylight vs. night, etc. That’s why some tricks (like red plastic mulch) can help induce behavioral changes (like fruiting and fruit ripening) in some plants. I appreciate the sciencey article, as well as the They Might Be Giants reference! Unleashing my inner nerd this morning…. Happy to oblige – there’s no better way to start the day than by unleashing the inner nerd! I’m getting great results with regular T8 fluorescent tubes. At about $3.50 per tube it’s so much cheaper than the fancy grow lights. Unless you really want to drill into the micromoles of photons per square meter per second level of things, just think of it as a comparison table. Anyway, for a given level of perceived brightness (roughly speaking that is what lux measures), conventional florescent lamps are about 50% as emissive in the PAR region as are grow lamp tubes. That may well still be enough light to get your seedlings and plants to do what they need to do – and yes, a heck of a lot cheaper per tube! Ok, so I decided to get really geeky on this and run some numbers – think of this is the Extra Geeky Appendix…the stuff that was just way to out there to actually put in the body. It was inspired by the comment about using regular T8’s (those are the standard “long” florescent tubes…T8 is a size specification). 6 grow lights x 2700 lumens per grow light = 16,200 lumens per row of seedlings. 16,200 lumens x .85 utilization factor for an open industrial florescent fixture = 13,770. 27,540 lux * .029 micromole per second per square meter per lux = 800 micromole per second per square meter. Note that this is approaching or exceeding a threshold value: most plants can’t do much with light in excess of 30,000 lux (http://balisunset.hubpages.com/hub/Role-of-Light-in-Photosynthesis). In this case, the comparatively optimum distribution of photons (from the photosynthetic perspective) means that the illumination is probably more effective than the lux value would indicate and is “maxing out” what the rest of the plant’s physiology can support. 27,540 lux * .013 micromole per second per square meter per lux = 360 micromole per second per square meter. While this setup is also near the 30,000 lux limit, it is also sub-optimum from the photosynthetic perspective and so I’d wager that illumination is the limiting factor in the plant’s growth. Daylight is hard to pin down – “sky light” is commonly considered to be around 10,000 (though closer to half that value in our area) lux on a sunny day while direct sun can vary from 30,000 lux (sunrise/sunset) to four times that value (noon in the tropics). 60,000 lux * .018 micromole per second per square meter per lux = 1,080 micromole per second per square meter. Our grow light setup is delivering about 80% of the potential illumination of my somewhat arbitrary median northern sun. Keep in mind that this is for direct sun and that it is per unit time, so if our lights are on twice as long as the sun would be hitting them then they get twice as many photons. A setup identical to ours but fitted with conventional phosphor lamps will deliver about 1/3 of the potential illumination of a median northern sun. 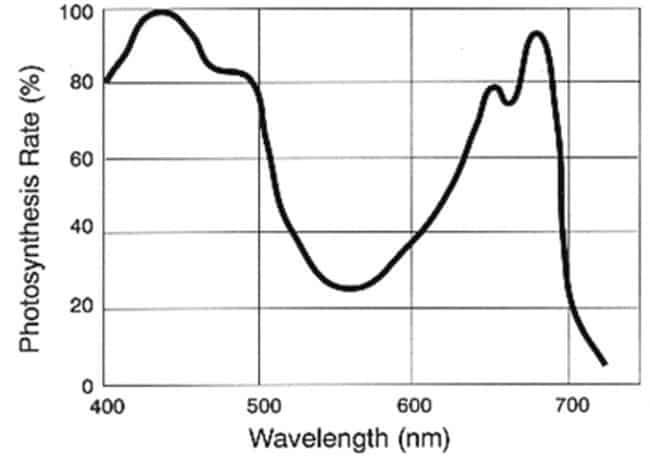 Looking at the 30,000 lux limit, at a daylight spectral distribution that works out to 540 micromole per second per square meter – grow lights and sunlight exceed this value by a fair amount (e.g. light level is not the limiting factor) while conventional lights approach 70% of this value and so probably do constitute a limiting factor (though the curve is probably asymptotic and so you are probably getting more than 70% of the potential growth out of seedlings even under conventional lights). Both our grow light setup and direct sun are likely to exceed the plant’s needs – though you can think of that as margin to make sure that light is getting to lower leaves, compensating for dirt on the bulbs, etc. Now keep in mind that sky brightness (illumination received from the sky and not from direct sunlight) is about 10% of the direct sunlight intensity. And an overcast day can reduce that by as much as a further factor of 10. Now add in the filtering effect of a coated window and all of a sudden it is easy to see why the grow light seedling is doing so well and why high intensity, indoor grow systems can be so productive. You can create a situation where the plant’s photosynthetic ability is the sole limiting factor in growth – provided it is supplied with enough other nutrients (and things like CO2 enrichment are used in some commercial greenhouses to raise some of these limits). Super awesome dorky appendix, Nick. Great analysis. How does distance from the light source figure in? I’ve been told closer is better, and my setup is similar to yours with the lights just 1-2″ above the starts. I’ve also noticed that starts on the outside of a seed tray do less well than those in the middle (slower to germinate, slower to grow). I blame it on lower temperatures in the outer cells. Distance plays a pretty significant role – but not directly. Atmospheric attenuation isn’t really going to be a big deal at these distances (unless you are gardening inside a fog bank). But the further your light is from your seedlings, the more that light is going to spread out – the same number of photos are going to be illuminating a larger area and therefore fewer photons impacting on any given area/leaf/etc. Suppose my light is 1 foot away from my plants and illuminating an area of 10 square feet with 10 zillion photons per second…each square foot is getting one zillion photos per second. Now I move that light to two feet away, doubling the distance. The area illuminated goes up by a factor of four (2^2) to 40 square feet. The light is still putting out the same 10 zillion photons per second, so each square foot is now only receiving 1/4 zillion per second (1/(2^2) of the original rate). For “real” plants it gets a little more complicated – there is some depth to the area illuminated once things start to sprout (unless you are growing moss!) and the falloff isn’t quite as dramatic to the lower leaves (which are already receiving less light, however) as it is on the top leaves. Holy cow, I really appreciate this! I CANNOT get anything but leggy icky seedlings (that invariably die) when I grow them in our southern window and I kept wondering, “do I really need grow lights?” Now I know, and now I know why. Thank you so much! This also helps me plan out our greenhouse, which I was planning on using cheap Craigslist windows for but now know better. THANK YOU!! If the cheap Craigslist windows are old single pane stuff, that’s probably just fine. An old, leaky, 1950’s picture window is perfect for a greenhouse. and… indicates that no, i would not be successful trying to grow an herb garden in my apartment that has crappy light all around (no good facing windows)…. and we have zero space for grow lights. Would you know of any apartment sized (as in almost zero space) alternatives? Hang grow lights under your coffee table?